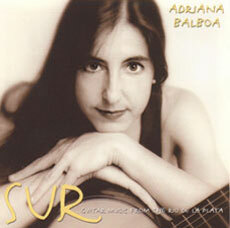 "The tango is a music of melancholy, and Uruguayan Adriana Balboa’s guitar weeps with the sound on this solo album. Based now in Germany, Balboa offers a tribute to the Rio de la Plata, the river that flows between Buenos Aires and her native Montevideo. She leads off with four popular cuts by the renowned bandoneonist and band leader Aníbal Troilo, including the great title cut, “Sur,” a moving, heart-wrenching tango anthem. In addition to songs by several Uruguayan composers, she also plays five of the lesser-known pieces of the master of the nuevo tango, Astor Piazzolla.